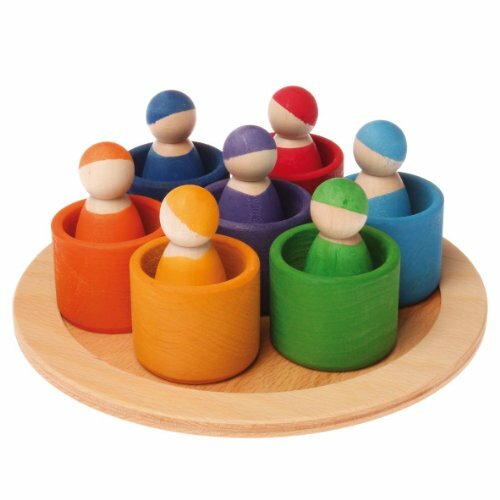 Seven Friends in 7 Bowls is a fabulous Waldorf toy for every family. The components can be played with in so many creative ways. Children of all ages (1+) will imagine their own fun ways to use them, and caregivers can guide children in activities such as sorting and counting. Older children will love using leftover ribbons or fabrics to craft their own "clothes" for the dolls, or to include as part of a seasonal table display. The dolls have simple forms to allow children to supply their own creativity to decide "who" the dolls are. The bright colors are delightful and will draw attention from whomever sees them. All parts are crafted by hand in Germany from sustainably harvested European wood. All edges are rounded for safety, then the natural waterbased stains are applied to the wood before they are finally finished with natural food-grade vegetable oil. All coatings are certified nontoxic and conform to stringent European (and American) toy standards, making them safe and suitable for children. Comes minimally-packaged in clear shrinkwrap. Tray is 19 cm, Each Peg Doll is 6 cm, Cups are 4 cm in height, 5 cm in diameter. Grimm's Spiel and Holz Design is a manufacturer of high quality, imaginative wooden toys. 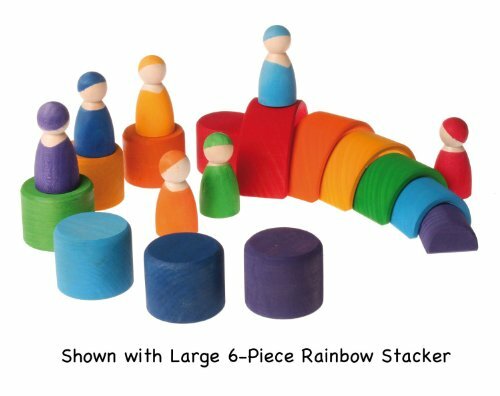 Inspired by the philosophy of Waldorf education, these beautiful and unique playthings employ simple shapes, vibrant natural colors, and a gentle texture that can be enjoyed by both children and adults of all ages. Grimm's toys are designed with the intention of helping children discover and develop their own creativity leaving plenty of room for independent play and imagination. 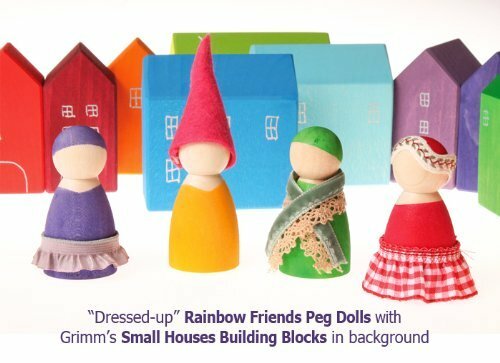 Grimm's creates puzzles, dolls and building sets that are gorgeous, and also work as décor pieces for a beautiful home. There are no instructions, and you can do no wrong with a Grimm's toy. Just play, learn, and enjoy.